On 4 November 2008, Crane's Chairman Jean Venables became President of the Institution of Civil Engineers – the first woman President in the Institution's in 190-year history. Jean pledged to use the platform of her presidency to promote debate on key issues such as climate change and risk management, as well as focusing on diversity within the profession. In her Presidential address, Jean Venables said: "Climate change is widely regarded as the biggest risk and challenge we face today. Action must be taken now if we are to have any hope of meeting our targets in 2050, and investment must continue despite the current financial problems. "What we are building now is going to dictate what greenhouse gases are emitted from our buildings and infrastructure in the decades to come. We have got to engender the same sense of urgency and importance about climate change that the recent banking crisis has had. "Engineers have the skills to deliver the solutions to climate change that the country and indeed the entire world needs. It is time to ensure they are placed right at the heart of infrastructure policy decision making, advising the government every step of the way." Jean, who was awarded an OBE for her services to flood defence, joined the ICE as a student in 1967, became only the 16th female Chartered Member, and is keen to encourage more women into the profession: "The ICE currently has only 8% female membership across all grades, so clearly there is much to be done to get more women into civil engineering. However, the landscape is already changing with 20% of the student and graduate member grades being women. "And it is not just about women. If we are to truly encourage diversity we must also look at the proportion of ethnic minorities and disabled workers and recruit from the whole pool to get the best talent." On 22 August 2006, Jean Venables took part in a panel of experts answering questions at a Background Briefing organised by the Science Media Centre. Just one year after Hurricane Katrina caused devastation in the US, the question is being asked – could this happen in the UK? Severe weather is always a risk in the UK and a rise in sea levels as a result of climate change is likely to increase the risk of flooding world-wide. The Association of British Insurers and the Government’s own Select Committee have warned that flood defence spending needs to increase by 10% a year to £750 million by 2011 to deal with the heightened flood risk. Yet instead, the current budget for all flood risk management spending – including flood risk warning systems and evacuation planning – has been reduced. One important lesson to be learned from the disastrous flooding in New Orleans is that investment is needed not just in capital flood defence works, but also in the maintenance and monitoring of existing defences, especially in estuarial areas where subsidence is often a problem. Furthermore, the UK government must be aware that by increasing the numbers of people living in areas of high flood risk it is also increasing the number of people potentially at risk should a flood event occur. If large-scale housing construction programmes in flood plains are inevitable, then improvements to Building Regulations are needed to ensure sufficient flood resilience of buildings. Download press release (pdf, 212 Kb). On 8 March 2006, Roger Venables gave a presentation at an event organised by the Institution of Engineering and Technology (IET), the Institution of Mechincial Engineers (IMechE) and the Institution of Civil Engineers (ICE). Entitled 'The Great Energy Debate: Are we doing enough to keep the lights on? ', the event's aim was to provide an informed view on this question. Experts on energy conservation and the options for future electrical generation explained what is being done and what part the technologies can play in meeting future demand for electrical power. Roger Venables' talk rephrased the question by asking: "Are we doing enough to turn off the lights we don't need?". His angle on the debate was that far more emphasis needed to be placed on conserving energy than has so far been the case. Engineers from all sectors of engineering are best-placed to initiate the required shift, and Roger Venables highlighted examples of engineering solutions that help reduce energy consumption without any need for active change in consumer behaviour. The event was recorded by IET.TV and you can view the presentation online on the IET.TV website. (Requires version 8 or newer of RealPlayer or Windows Media Player.) Note: the IET.TV archive is continually updated. If the clip is not there, use the search function and type in 'Roger Venables'. The ICE and IMechE London Regions repeated the event at the Institution of Mechnical Engineers and at Brunel University. We are delighted to announce that Jean Venables has been elected a Fellow of the Royal Academy of Engineering. As Britain’s national academy for engineering, the Royal Academy brings together the country’s most eminent engineers from all disciplines to promote excellence in the science, art and practice of engineering. Their strategic priorities are to enhance the UK’s engineering capabilities, to celebrate excellence and inspire the next generation, and to lead debate by guiding informed thinking and influencing public policy. Election to become a Fellow is therefore one of the highest accolades that professional engineers can bestow upon their colleagues, and Jean is acutely conscious and proud of the honour of her election. She looks forward, as other commitments permit, to playing her part in taking the Academy forward. On 1st January 2006, Jean Venables took up the post of Chief Executive of the Association of Drainage Authorities (ADA). Jean took over from David Noble OBE who retired after 18 years at ADA. The appointment is part-time and with support provided through her colleagues at Crane's sister company, Venables Consultancy. ADA is the membership organisation for those involved in water level management, including Internal Drainage Boards, Environment Agency Flood Defence Committees, the Northern Ireland Rivers Agency, Local Authorities, Consultants, Contractors and Suppliers. For nine years until 2003, Jean was Chairman of the Thames Regional Flood Defence Committee and was a Vice President of the Association for three years before taking up her new post, so she is familiar with many of the issues ADA members are facing and brings wide-ranging experience to the many challenges and opportunities ahead for ADA and its members. 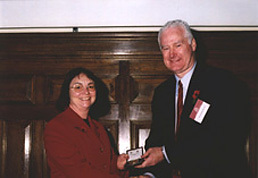 On 2 November 2005, Jean took up office as succeeding Vice President of the Institution of Civil Engineers. Subject to re-election each year, she will become ICE President in November 2008. Jean has been actively involved with the Institution for over 30 years. She had been non-succeeding Vice President since 2003, and had previously served on the ICE Council from 1975 to 1978 and again from 1993 to 1996. She leads the Institution's work on Membership, and work related to the Olympics 2012, and contributes significantly to the Institution’s work on Professional Conduct. In addition, she is a member of the Environment & Sustainability Board and serves as the Institution's representative on the Court of Imperial College. Previously she has been a member of the Disciplinary Board, the Investigating Panel and the Waste Management Working Party on Construction Waste 1999 to 2001. She has also had a long-standing involvement in the Institution's Benevolent Fund, as a member and Vice Chairman of the Fund's Committee of Management and a member of its Investment Advisory Panel. In 2001, Jean was awarded the Garth Watson Medal for Services to the Institution – to her a most significant award, as she had worked closely with the then ICE Secretary when she was Chairman of the ALGS (the Association of London Graduates and Students). Having been the first woman ever to be elected to the Smeatonian Society in 2002, Jean will now also be the first woman President of the ICE in the Institution's 187-year history. A new guide, Engineering for Sustainable Development: Guiding Principles, produced by the Royal Academy of Engineering was launched on 6th September 2005. The Guide uses case study examples generated by The Academy's Visiting Professors Scheme and was edited by Roger Venables, Crane's Managing Director, and Richard Dodds, both Academy Visiting Professors (more about Roger's Visiting Professorship). A pdf version of the Guide can be downloaded from the links below. Download low-res pdf of the Guide (948 Kb). Download high-res pdf of the Guide (2.2 Mb). In Spring 2005, Jean was appointed to chair the Expert Panel for the Thames Estuary 2100 Project, which is investigating all the options for flood risk management in the Thames Estuary up to 2100. The project is a result of an initiative Jean supported in 1999 when Chairman of the Thames Region Flood Defence Committees, together with her fellow chairmen in the Anglian and Southern Regions. Following the 1953 floods, it had taken 30 years for the Thames Barrier to be operational. It is predicted that the level of protection provided by the Barrier and the downstream walls will drop below the 1-in-1000-year design return period in 2030. With this in mind, Jean and her colleagues pressed for a proactive approach to looking at future flood defences for the region, which led to the setting up of the Thames Estuary 2100 Project. Jean is especially pleased to be involved in this project, which is very close to her heart. Her long-standing concern about, and involvement in, Thames flood defences and flood risk management includes having chaired the Thames Region Flood Defence Committee for nine years, from 1994 to 2003. In October 2002, Roger Venables, Crane's Managing Director, was appointed as the Royal Academy of Engineering Visiting Professor in Engineering for Sustainable Development at Queen's University, Belfast. In 2005, this appointment, originally running for three years, was extended until the end of 2008. His main task is to generate case-study-based teaching materials and assist staff to better understand their sustainability agenda, enabling them to teach their specialism in the context of sustainable development. 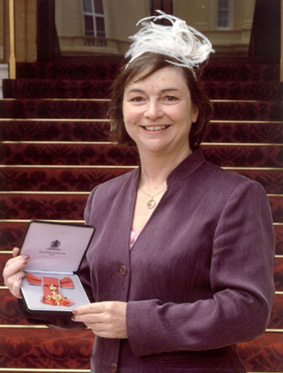 Crane's Chairman Jean Venables was awarded an OBE for services to flood defence in the New Year Honours List 2004. For almost 20 years, Jean has been a member of the Environment Agency's Thames Region's Flood Defence Committee and was Chairman for nine years until July 2003. She was the first engineer, and the first woman, to be appointed by Government as a flood defence committee Chairman. One of Jean's major achievements during her work as flood defence Chairman was to oversee the successful completion of the Jubilee River flood alleviation scheme in 2002. In December 2003 Crane completed work on a resource & training pack for CIRIA, entitled 'Working with Wildlife'. It is aimed at enabling training of anyone involved in construction projects to understand and deal properly with wildlife issues on their project. The pack was published by CIRIA in 2004. In addition to a training guide addressing the fundamentals of ecology, key legislation and practical guidance, it contains extensive supporting materials, including a PowerPoint presentation, habitat and species briefing sheets, toolbox talk sheets, a pocket book and a gazetteer of organisations. 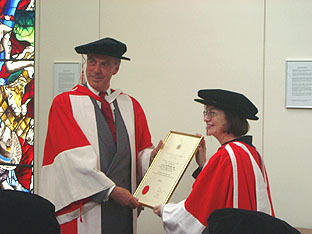 In May 2003, Jean Venables, Chairman of Crane Environmental, was presented with her Diploma of Fellowship of the City & Guilds of London Institute at a ceremony at the Institute in the City of London. An Associate of the Institute through her undergraduate study at Imperial College, Jean's election to fellowship recognised her long-term interest and work in vocational education and training. In February 2003 Jean Venables delivered the Dugald Clerk Lecture at the Institution of Civil Engineers, speaking on "The Thames Estuary  Yesterday, Today and Tomorrow". The lecture included coverage of how the present situation has developed, the current flood defence provision, and the flood risk management options for the future. In 2001 and 2002, Crane's Managing Director Roger Venables delivered the Institution of Civil Engineers' annual Brunel Lecture at venues in Australia, New Zealand, Hong Kong, Malaysia, Thailand, South Africa and France, and at the ICE in London. The lecture was entitled "Delivering Sustainable Development in Construction" and its key message was that, despite the challenges that the concept of sustainable development presents to us, there is no longer any excuse for doing nothing about making development projects more sustainable. We know enough about the practical actions to take (many of which are illustrated and discussed in the lecture) to make a difference now. If you would like a full version of the PowerPoint presentation, including images, please contact Crane Environmental and we will be happy to send you a copy on CD. A great pleasure for all the team at Crane was the award in November 2001 to Jean Venables of the Garth Watson Medal by the Institution of Civil Engineers, for her long and unstinting service to the ICE. Currently a member of the Institution's (Complaints) Investigating Panel, Jean has completed a three-year term on the ICE's Waste Management Board, which included her chairing a joint Working party of the ICE and the Institute of Waste Management, on Construction and Demolition Waste. Jean looks forward to continuing her ICE involvement in a range of ways.